Who are you in the kitchen, and who do you want to be? From an Ayurvedic perspective, the kitchen and what happens in it, is a major indicator of the level of nourishment our bodies, minds and consciousness receive. Since food is a major building block for the physical body (besides exercise, breath body practices, sleep and massage) it is important to pay attention to what we stuff in the pie hole and with what awareness that food has been prepared. Some of us love to be in the kitchen. We thrive, we are empowered and find joy in prepping food for ourselves and family. Others get virtually nauseated just thinking about having to cook yet another meal. We all have certain archetypes also when we think of it from the perspective of the kitchen. 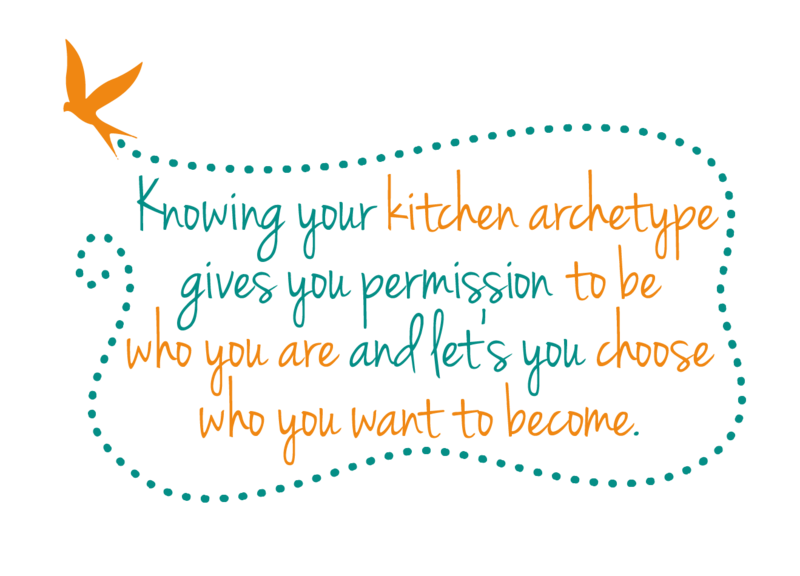 Knowing your kitchen archetype gives you permission to be who you are and let’s you choose who you want to become. It creates ease. NOT knowing your kitchen archetype and thinking (likely subconsciously) it should be different creates tension in your mind and an internal struggle to be different. Looking back at my own history and how I grew up, my Mom was the perfect housewife and cook. Whatever she touched in the kitchen turned into a culinary delight. Wonderful to receive, yet disturbing if you want to have that ability yourself but can’t seem to cultivate it..
For years, I felt uncomfortable preparing food for others and it took me years to find my own cooking style. That was troublesome when it came to having friends over for dinner, hosting a party or cooking for a partner. I grew up being the prep cook and dishwasher and hardly, if ever, given the responsibility to cook the end product. For me, that caused a lack of self confidence and disempowerment. Being married to a chef later down the road didn’t make things any more rosy. It was only when I got divorced and found myself in a single household, that I started embracing a kitchen queen and goddess attitude. Without the fear of judgement from family members I was able to blossom in the kitchen. I found my way to healthfully and tastefully preparing meals, according to my own taste and standards. And they are different from the German traditional way my mom cooks or the french chefing my ex-husband practices. It is my own style influenced by Ayurveda, yoga and my intuition. I turned from prep cook into lead chef when it comes to my own kitchen. When I find myself back in my Mom’s kitchen I invariably turn prep cook again which I now choose as my archetype instead feeling victimized by it. I also started experimenting with bringing in my own two cents. I purchased a sprouting device and snatched my sister’s blender. Every morning, when with family, I prepare a small glass of prana filled, green smoothie for everyone. In that sense I have chosen a kitchen inspirer archetype as I am doing something out of the ordinary for my family. Despite sarcastic remarks, which is to be expected from Germans, my family, even my Dad, willingly jugs down the healthy liquid. Knowing which role I play in each environment puts me at ease and also let’s me choose consciously who I want to be. I can let go into the moment instead of arguing with myself or trying to be something I am not. 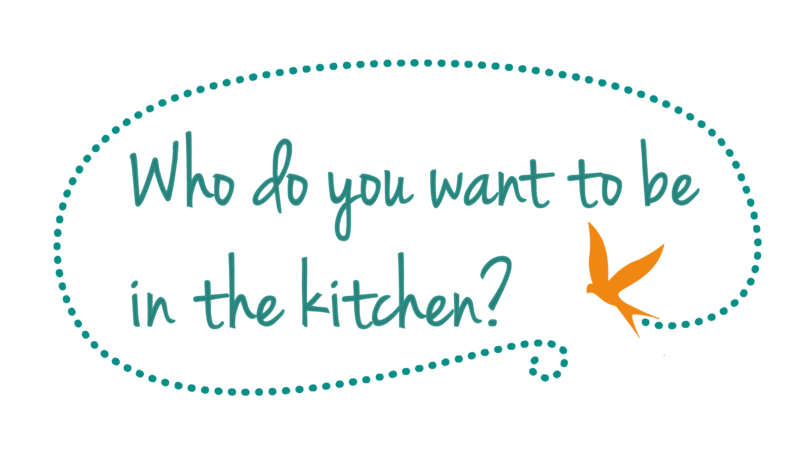 Who are you in the kitchen and who do you want to be? Kitchen goddess who owns the kitchen with an abundant, bountiful, creative, friendly energy. Allows co-creation in the kitchen. Directs in a collaborative way. Is powerful and directive but not forceful. No hierarchy. Kitchen Queen who is the ruler of the kitchen. Often housewifes embody this archetype. Cooks from scratch. Well organized. Has a defined flow in the work zone. Directs and completes the meal. Has all kitchen tools imaginable. Takes pride in serving a good meal, typically derives satisfaction from being the director. Empowered. Takes charge. Can be forceful in getting things done. Top down hierarchy. Kitchen Inspirer who has the courage to cook differently from everyone else in the household. Researches new or traditional ways of preparing food. Creative approach to cooking. Knows more than other family members about healthy eating and shares that knowledge in a non threatening way. Kitchen servant who is the helper. Takes orders from the kitchen queen. Does prep and clean up work. Disempowered. Does not take initiative despite being hungry. Reluctant to start cooking a meal without the queen bee being present. Kitchen slave who has an attitude of having to cook rather than getting to. Little joy and love goes into cooking. Views the kitchen as a never ending job. Kitchen = drudgery. Householders often feel that way. Kitchen trashcan who finishes off everyone’s plate. Eats leftovers right out of the fridge without warming it or creating a full meal out of it. Chooses food not primarily based on nurturing oneself but as a means to cleaning out the fridge.